At the start of this week my Lectionary (it’s a set of readings for the Anglican church) told me we were now in ‘ordinary time’. This means we are not in a period of the church year leading up to a major festival such as Christmas, Easter or Pentecost (which was last Sunday). So we are in ‘ordinary time’. But there is a part of me that wants to shout ‘there is no such thing as ordinary time’! Time is extraordinary, every day is a gift. To anyone with a terminal diagnosis all time is extraordinary. And, like it or not, we all have a terminal diagnosis. The mortality rate for human beings is 100%. It’s all just a question of time. I’m not meaning to be overly gloomy. But what has really struck me is that we cannot call any day ‘ordinary’ even days when we feel ‘Meh’ (you know what I mean). On any ‘ordinary day’ the smallest incident, conversation or action might have unseen ripples of effect, might eventually produce ‘fruit’ – for good or bad. And thinking about fruit, makes me think about gardening. 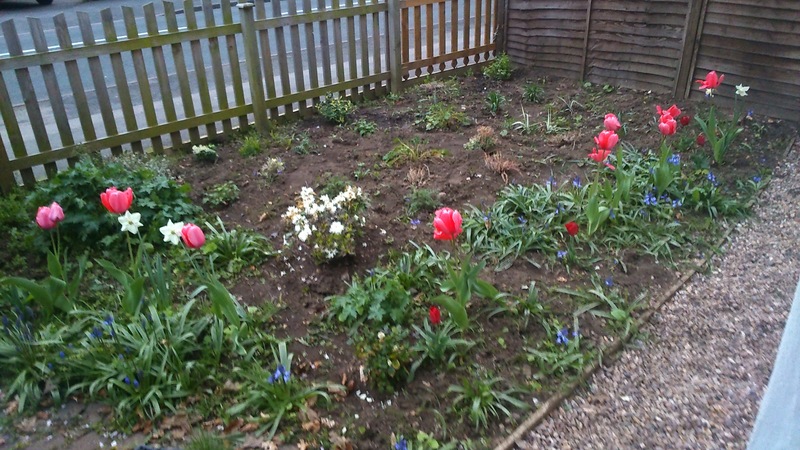 Since moving into the Vicarage and taking up this post, I have taken responsibility for the two patches of bare earth left to us by the garden clearance guy we employed (David looks after all the rest of the garden). I know virtually nothing about gardening but I do know I don’t like bare earth. So the first thing I did back in November was plant some bulbs. When these came up (to my utter amazement) they gave me so much joy that ever since I have been secretly sneaking off round markets and garden centres buying up … well anything that takes my fancy really. Anything cheap that is, because so small is the faith I have in my gardening abilities I’m not yet ready to invest heavily. Nor do I have any idea of a plan. If there is a plan it’s ‘stick it in the ground and see if it grows’. It’s gone a bit mad but at least it’s not a bare patch of earth. And as for the weeds – I’ve battled weekly with them on my day off and discovered to my surprise that weeding is enormously therapeutic: all that stabbing at the ground with fork and yanking things up, it’s good for getting rid of aggression and so long as you don’t do more than 20 minutes at a time it doesn’t have to be bad for your back. 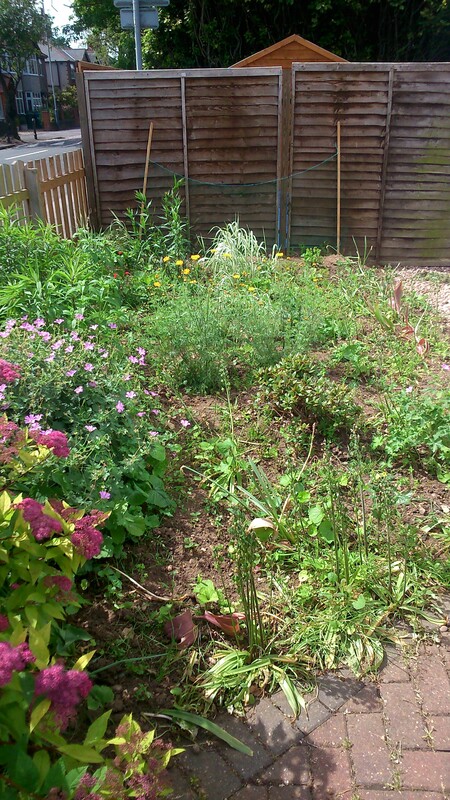 As you can see there’s still alot of weeds left. The Vicarage garden is proving extraordinarily fertile – everywhere we look stuff is bursting forth and not all of it good or in the right place. Because we are NOT horticulturists we had covered over the previous veggie patch with weed blanket and a thick layer of stones. But potato plants are resiliently shoving themselves up to the light through the stones!! Who knows the raspberries for which this garden was famed may even make a comeback attempt later in the year. All this is very metaphorical: a new garden and a new job, a sensed lack of expertise in both, both enterprises are about ‘growing stuff’. So I’m in my first year as minister her and yes stuff is growing but it’s all fairly chaotic, weeds along with the good stuff and there isn’t much of a plan. So I shouldn’t be surprised by my new found interest in gardens. Around the time I was appointed to lead this church, a praying friend gave me a picture of my ministry as one of clearing the ground of brambles, preparing the ground for growth’. As an image it didn’t excite at the time. As a gardener, walking round my garden seeing things that badly need pulling up or clearing away, I feel a little more excited. Mind you it’s blinking hard work, this gardening/church growing thing and for a lot of the time it looks like nothing is happening (‘you can say that again’) but when something comes up that you threw into the ground – oh wow! 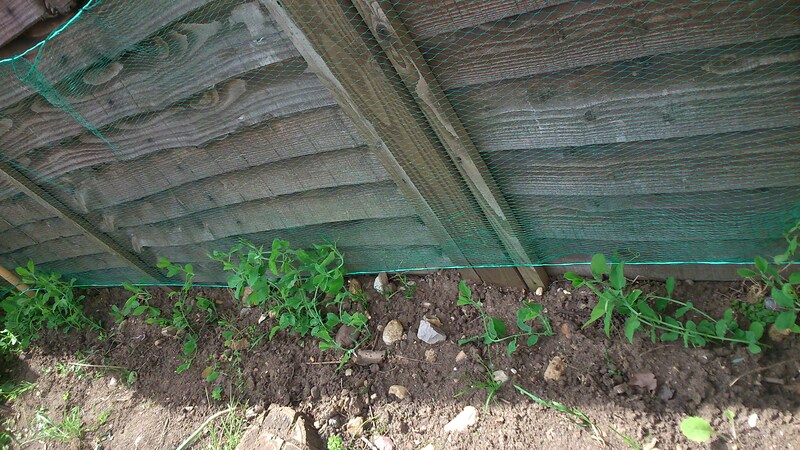 Here are ‘my’ sweet peas – I threw a packet of seeds into the ground and promptly forgot about them. Only when a friend mentioned about growing sweet peas did I think ‘Oh yea, I planted some of those‘ and when I went back to look – WoW! There they were, overwhelmed with weeds but coming up all the same. So I’ve given them some space and something to climb up. ‘I will make rivers flow on barren heights, and springs within valleys, I will turn the desert into pools of water and the parched ground into springs. I will put in the desert the cedar, and the acacia, the myrtle and the olive. I will set pines in the wasteland, the fir and the cypress together… so that people may see and know… that the Holy One of Israel has created it’. Welcome to my world! Most weeds are edible. Have a look at the book THE THRIFTY FORAGER by Alys Fowler for pictures and recipes.